The OH-4 Humigel™ Replacement Kit is of critical importance for the successful use of our humidifiers. The ONLY reason for the use of the crystals is to reduce the risk of damage to your instrument from potential leaks. Humigel™ crystals are very hygroscopic and hold up to 400 times their weight in water. We add .6 cc’s of crystals prior to packaging. This is such a small quantity that you can barely see them at the bottom of the humidifier. The best way to tell if they are present is to shake the humidifier and hear them rattle around. .6 cc’s is the amount needed to turn the water into jelly. Unlike water, the jelly is semi-solid and will contain the water should the humidifier become damaged. With the crystals present, a damaged humidifier will become damp or have water spots but will not leak into your instrument. More than .6 cc’s of Humigel crystals will reduce the ability of the humidifier to function. When there are too many crystals, the water stays suspended in the crystals, and will not evaporate through the fabric of the humidifier, and cannot humidify your instrument. After initially filling your humidifier with distilled water wait 10 minutes. When you look into the humidifier, it should look like clear small curd cottage cheese. If it doesn’t look this way, and you have standing water, you need to get a OH-4 Humigel™ Replacement Kit and replace the crystals. 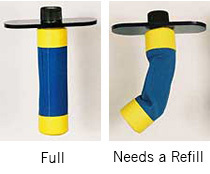 Each kit holds 6-8 refills. As long as you reseal the small zip lock bag inside the kit and leave the desiccant bag in place, the kit will last a long time. Without resealing and the desiccant bag, the crystals cake up with water absorbed from the air. Most instruments only need seasonal humidification. Typically, the humidity drops in the fall and rises in the spring. When the spring arrives, we recommend that you remove the humidifier, wash all of the crystals out, and leave the cap loosely on the humidifier. If you do not remove the crystals and loosen the cap, the humidifier will shrink up, dry up and the crystals will stick together. In the fall, it is easy to damage the lining of the humidifier when trying to restore it to shape. The lining is only 1/1000th of an inch thick and can be damaged easily if it sticks to itself and the crystals, when the humidifier shrinks up and dries up if the lid is left on tight. 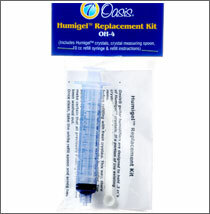 Purchase OH-4 Humigel™ Replacement Kit today.